One of my tried and true standbys for last minute party favors, and favorite little treats to indulge upon, have to be truffles. Clean and classic, these are a chic little delicacy that are sure to impress. I made a batch for a recent "ladies night out" for my daughter's school- a last minute decision that proved to be a good one. Although it is a little involved with chocolate melting and hand dipping, it is relatively low key since the oven and mixer are not needed for this confection. Dark Chocolate Chips 1 lb. Heavy Cream 8 fl. oz. Butter. room temperature 2 tbsp. Heat the heavy cream and sugar in a medium sauce pan until it just starts to boil. With the chocolate in a medium sized stainless steel bowl, pour the hot cream over the chocolate and let sit for about one minute. Gently stir together with a rubber spatula until it is has completely blended together, and then add in the butter. Let this sit, covered, for about one hour, or until it has thickened slightly. The ganache should be slightly firm, so soften it by mixing it with a rubber spatula, and then place it into a piping bag. One a sheet try lined with either a baking mat or parchment paper, pipe the desired size, about the width of a quarter. 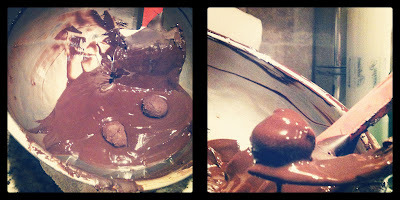 Once the ganache is all piped. Let the truffles sit until they have slightly firmed, and then roll them as round as possible, and then place in the refrigerator for 20 minutes. Now is the time to either coat the truffles and then hand dip them in tempered chocolate, or finish them by rolling them in cocoa powder. I think the hand dipped method, although more time consuming, yields a much more elegant result. To coat them in cocoa, place about 10 oz. of cocoa in a bowl and then completely cover each truffle evenly. But if you are up to hand dipping, here is a nice little video that briefly explains chocolate tempering. In a stainless steel bowl, melt down 2 lbs. of chocolate over a water bath. Once it has completely melted and the side of the bowl feels warm, take the bowl off of the heat source, and then add in an additional 1 lb. of chocolate chips. Mix this gently until the chips have melted and the side of the bowl feels cool against your skin. If, when you are working with the chocolate, it starts to set, you can quickly place it over that water bath, and then mix until it is fluid again. Test the chocolate by dipping in a butter knife and letting it sit for 3-4 minutes to make sure it is still in temper- I usually do this after I get it tempered, and then each time I warm it just to be sure. 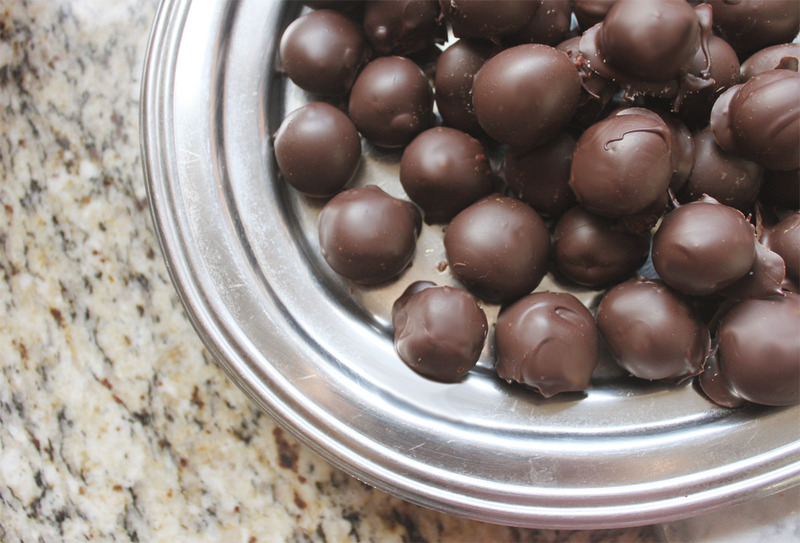 With a little chocolate in the palm of your hand, give each truffle a thin coat of chocolate and then place on a parchment lined baking sheet. This step makes it much easier to work with the truffles when you are dipping them. Once they are all pre-coated, set up a "chocolate dipping station". From left to right, I put down 1. a piece of parchment to set dipped truffles onto, 2. the tempered bowl of chocolate with a fork and knife- the fork for dipping and the knife for pushing the truffle off of the fork, and 3. the tray of pre-coated truffles. Put 3-4 truffles in the bowl of chocolate at a time, and then push chocolate over the top of them. Using the fork, pull the truffle from the chocolate and then gently scrape the bottom of the truffle on the edge of the bowl to remove excess chocolate. Place the end of the fork against the parchment, and then with the knife, gently push the truffle off of the fork. Once they are all finished, they are ready to enjoy! 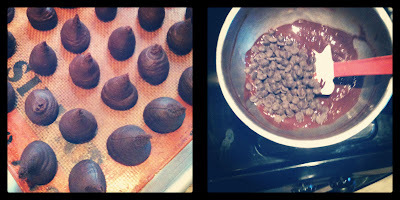 I've only ever made Oreo truffles and I had so much trouble with the chocolate tempering. I'm going to give these a try. Thank you for posting such detailed instructions!